High-ranking leaders from the Popular Front for the Liberation of Palestine (PFLP) met on Wednesday with Egyptian intelligence chief Umar Sulaiman, who is working to broker a ceasefire between Palestinian factions and Israel. The PFLP's deputy secretary general, Abdul-Rahim Malluh, said that PFLP leaders also met with the Arab League's Secretary General Amr Mousa to discuss efforts at restoring Palestinian unity. 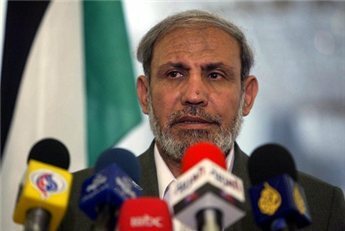 Hamas leader Mahmoud Zahhar reiterated on Tuesday that his movement, which controls the Gaza Strip, is prepared to accept a bilateral ceasefire. Palestinian President Mahmoud Abbas, the leader of Hamas' rival, Fatah, expressed quiet support for a ceasefire. Malluh said priority should be given to bridging the gap between Hamas and Fatah. He added that the PFLP would not oppose any agreement that Palestinians unanimously agree on, especially if it ends the siege on the Gaza Strip. Malluh said that the Yemeni president's initiative for Palestinian unity was discussed at the meeting with Amr Moussa. Israeli forces raided home of wanted Palestinian activist Ammar Abu Ghalyun in Jenin refugee camp after midnight on Wednesday. Ghalyun is affiliated to Fatah's armed wing, the Al-Aqsa Brigades. Local sources told Ma'an's reporter that undercover Israeli forces entered the camp after midnight in three Palestinian-plated cars at midnight and surrounded Abu Ghalyun's house. Then more than 20 Israeli military vehicles invaded the camp and closed all its entrances amidst heavy gunfire. They ordered Abu Ghalun through a loudspeaker to turn himself over. They recieved no answer because he was not at home. Local sources added that after a number of unanswered calls, the soldiers broke into the house and damaged its interior as they searched for Abu Ghalun. When they failed to find him in his own home, the Israeli troops broke into neighboring houses and searched them, again in vain. Later, Abu Ghalyun telephoned Ma'an's reporter and told him that he had been at home, but suspected that the cars that parked near his house were Israeli special forces. He claimed that he managed to flee before the rest of the Israeli troops arrived. Israeli authorities on Wednesday imposed a three-year closure of a sewing workshop operated by the Islamic Charitable Society in Hebron in the southern West Bank. Witnesses said that approximately 40 Israeli soldiers raided the sewing workshop, which is located on the first floor of a girls' orphanage operated by the Islamic Society, at 1am on Wednesday. In the course of a two hour raid, the Israeli troops ransacked the workshop after breaking down its main gates and doors. Israeli soldiers confiscated all the sewing machines, furniture, and clothes which were to be given to orphans. International human rights workers with the organization Christian Peacemaker Teams (CPT) said: "soldiers looted the workshop of all its sewing and processing machines, office equipment, rolls of cloth, finished clothing and supplies." Members of CPT documented the raid, and the contents of the workshop being loaded into two forty foot tucks. Two weeks ago, the Israeli forces ransacked the workshop and delivered the military order demanding a three-year closure. They also told the workers and management that the workshop must be evacuated before 28 April, otherwise every thing would be confiscated. The workshop was established in 1985 and it employs 15 female orphan workers. The workshop produces long Islamic outfits for orphans. For its part, the popular campaign for supporting orphans warned the Israelis of the repercussions of their campaign against the Islamic charity's properties. They called for community-based action against the Israeli crackdown in Hebron. Palestinian security sources told Ma'an's reporter in Nablus that Israeli troops stormed the camp from the east after midnight and ransacked several houses before seizing ten young men. The military wing affiliated of Fatah, the Al-Aqsa Brigades, claimed in a statement on Wednesday that a group of their fighters survived an assassination attempt when an Israeli tank fired on them near the Agricultural College in Beit Hanoun in the northern Gaza Strip. The statement also said that two homemade projectiles have been launched at the Israeli town of Sedrot this morning. Twelve Palestinian political and military factions have agreed in principle to accept a ceasefire with Israel. However, Palestinian leaders agreed that any agreement should be bilateral, apply to both the Gaza Strip and the West Bank, and include an end to the siege of the Gaza Strip. Leaders from a dozen minor factions are in Cairo this week meeting with Egyptian mediators. The talks will resume on Wednesday. The Egyptian mediators are scheduled to resume on Wednesday a round of negotiations with 12 Palestinian factions hoping to reach a ceasefire agreement with Israel. The Egyptian Al-Ahram newspaper quoted most of the Palestinian factions who took part in the talks as saying that they ceasefire should be immediately followed by Egyptian-supervised talks aimed at restoring Palestinian national unity. Some factions expressed reservations regarding the Hamas-proposed ceasefire, yet they affirmed they would not block a ceasefire agreement despite their reservations. Mahir At-Tahir, a leader in the leftist Popular Front for the Liberation of Palestine (PFLP), told the Qatar-based Al-Jazeera television that the PFLP told Umar Sulaiman, the head of the Egyptian intelligence service, that they would not oppose any agreement that is beneficial to the Palestinian people. At-Tahir also revealed that the PFLP's delegation met with Arab League Secretary-General Amr Mousa and suggested that he sponsor a dialogue between Palestinian rivals Hamas and Fatah based on a plan proposed by the PFLP. The PFLP has recently held talks with Hamas' leader in exile Khalid Mash'al in Damascus as well as Palestinian President Mahmoud Abbas while he was visiting Jordan. For his part, the deputy secretary general of Islamic Jihad, Ziad An-Nakhala stated that his movement too would agree on a ceasefire on the condition that it is bilateral and extends to both Gaza and the West Bank. He told the press in Cairo on Tuesday that the Islamic Jihad will react "positively" with any efforts aimed at protecting the Palestinian people's interests. Hamas has announced its readiness to accept a ceasefire that begins immediately in the Gaza Strip, and then expands to include the West Bank after six months. Some Palestinian factions demanded that the span before ceasefire extends to the West Bank be three months only, while other factions insisted that ceasefire should apply to both Gaza and the West Bank immediately. Hamas will not send any more emissaries to Egypt to discuss the possibility of a ceasefire with Israel, and will wait for Egyptian intelligence chief Umar Sulaiman to compel Israel to accept a truce offered by Hamas, senior Hamas leader Mahmoud Zahhar said on Tuesday. Speaking at a political meeting at the Islamic University in Gaza, Zahhar expected Umar Sulaiman to visit Israel soon in a final attempt to secure Israel's cooperation with a ceasefire. Zahhar also warned that Hamas would not hesitate to strike back if Israel refused to cooperate: "If Israel decides to reject a ceasefire, they will pay a heavy toll because the besieged Gaza Strip's people will have no choice but to defend their lives against the siege," added Zahhar. Nonetheless, Zahhar's remarks suggested that Hamas' offer for a truce is still on the table despite ongoing Israeli attacks, especially in the Gaza Strip. 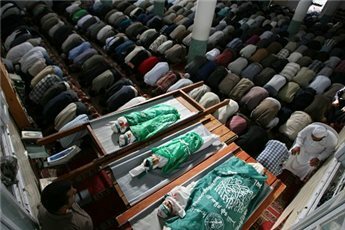 Israeli forces killed eight people, including a mother and her four young children, in the Gaza Strip on Monday. However, Zahhar expected optimism that Israel would agree to a ceasefire after haggling about the details of the agreement. The deal will include opening all Gaza Strip's terminals and crossings including Rafah crossing, in case the Egyptian efforts succeeded, he said. He also explained his view that has Hamas benefited from past ceasefires, especially in 2005. Zahhar, a founder of Hamas and the former Palestinian foreign minister, is considered to be one of the more hawkish members of the movement's leadership. Israeli forces on Tuesday morning invaded the West Bank village of Qarawat Bani Zeid, north of the city of Ramallah. Palestinian journalist Yahya Nafi' told Ma'an that Israeli troops searched and ransacked Palestinian homes. The Israeli soldiers did not say who they were looking for. They also erected a flying checkpoint at the entrance to the village impeding residents' movement and searching them as they move in and out of the community. Qarawat Bani Zeid is located on the main road between Ramallah and the towns of the northern West Bank. Israeli troops killed a young Palestinian man, 22-year-old Mu'adh Al-Akhras, in the An-Nada neighborhood in the northern Gaza Strip on Monday evening, witnesses and medical sources. Muawiya Hassanain, the director of ambulance and emergency services in the Palestinian Health Ministry, said the victim was taken to Kamal Udwan Hospital in the town of Beit Hanoun. Eyewitnesses said the Israeli troops continued to fire at residential houses in the area. 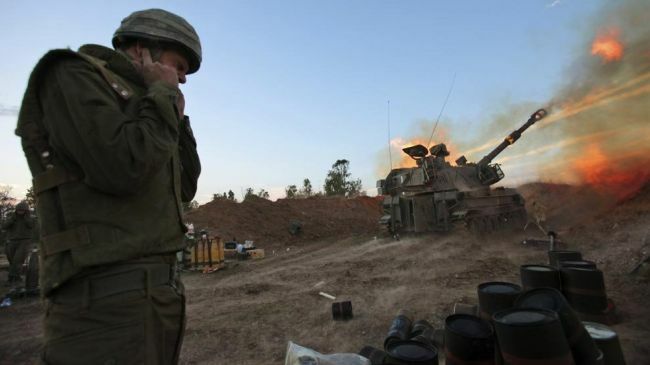 Israeli tanks and aircraft invaded Beit Hanoun early on Monday and bombarded the town until evening. Eight Palestinians were killed in the incursion, including a mother and her four young children, a teenager on his way to school, and one armed fighter. Palestinian leaders condemned the killings, terming Monday's events a "massacre." On Saturday Israeli forces killed a 14-year-old girl in neighboring Beit Lahiya. An Israeli airstrike in the town of Beit Hanoun, in the northern Gaza Strip, left four Palestinian fighters wounded on Monday afternoon, medical sources said. The four fighters were affiliated with the An-Nasser Salah Addin Brigades, the armed wing of the Popular Resistance Committees. Mu'awiya Hassanain, the director of ambulance and emergency services, in the Palestinian Health Ministry told Ma'an that all the injured were evacuated to Kamal Udwan Hospital. Israeli tanks and warplanes invaded Beit Hanoun early on Monday morning, killing seven Palestinians, including a mother and her four young children. Tanks are still operating in the town at the time of writing. Islamic Jihad's military wing, the Al-Quds Brigades said on Monday that their fighters fired a rocket-propelled grenade at an Israeli military personnel carrier in a citrus grove in the town of Beit Hanoun in the northern Gaza Strip. A statement released by the Al-Quds Brigades said the operation came in retaliation for Israeli atrocities against the Palestinian people. Separately, the military wing of the Popular Resistance Committees, the An-Nasser Salah Addin Brigades, said that their fighters blocked an Israeli incursion attempt near the area of Al-Hawooz in the northern Gaza Strip. The group claimed that they injured Israeli soldiers during an exchange of fire. Dozens of Palestinian families from the northern Gaza Strip town of Beit Hanoun left their apartments in tower number one at the An-Nada neighborhood to tower number 25 trying to find shelter from Israeli shelling. The coordinator of the local committee for countering Israeli attacks, Sabir Za'aneen said he saw dozens of women and children leaving their apartments and screaming as they headed towards tower number 25. He explained that they were seeking shelter after shrapnel of Israeli shells and gunshots broke the windows of their apartments. He also claimed that the Israeli soldiers deliberately fired at water tanks on the rooftops of the buildings as well as electricity cables. Seven people, including a mother and her four young children, were killed by Israeli fire in Beit Hanoun earlier on Monday. Israeli forces invaded the central West Bank cities of Ramallah, Al-Bireh, Beitunia and the nearby Al-Jalazun refugee camp on Monday morning. Palestinian security sources stated that several Israeli military vehicles stormed the southern neighborhoods of Al-Bireh and patrolled the city's streets. Meanwhile, Israeli soldiers ransacked several homes in Ramallah. The same sources explained that Israeli military vehicles roamed several neighborhoods in Beitunia and Al-Jalazun camp. No casualties or arrests have been reported. Seven Palestinians were killed, including a mother and her four young children, and at least seven others were injured when Israeli tanks shelled a house in the town of Beit Hanoun in the northern Gaza Strip on Monday morning, witnesses and medics said. Palestinian medics identified the mother, Khadra Abu Mu'attaq, and her children Ahmad Abu Mu'attaq, three-year-old Hana Abu Mu'attaq, four-year-old Salih Abu Mu'attaq, and six-year-old Rudayna Abu Mu'attaq. The family was inside the house, eating breakfast at the time of the shelling. A student, 17-year-old Ayyub Atallah, was killed on his way to school. His friend Mu'tasim Sweilim was injured. The sixth Palestinian killed was a member of the armed wing of Islamic Jihad, the Al-Quds Brigades, named Ibrahim Al-Hjuj. He was also identified by medical sources. Muawiya Hassanain, the Gaza-based director of ambulance and emergency services in the Palestinian Health Ministry, confirmed that the deaths took place after Israeli forces fired on the Abu Mu'attaq family home in Beit Hanoun. Witnesses reported that Israeli tanks and bulldozers invaded Beit Hanoun early on Monday morning and began firing on residential houses. On Sunday night Israeli forces raided the town of Deir Al-Balah, in the central Gaza Strip, seized 40 Palestinians, and used bulldozers to destroy agricultural lands, witnesses said. The Israeli forces withdrew at midnight. Palestinian President Mahmoud Abbas condemned what he called "Israeli aggression" in the town of Beit Hanoun in the Gaza Strip on Monday. Israeli tank fire killed seven Palestinians including a mother and her four young children in Beit Hanoun on Monday morning. "This assault does not serve the efforts to reach a ceasefire, and it impedes the peace process," Abbas said. He reaffirmed his support for a ceasefire in order to save the Palestinian people from more killing. In the same regard, the de facto Prime Minister of the Gaza Strip, Isma'il Haniyeh, condemned the Israeli attack, calling it a massacre. He said, "This reflects the real face of the Israeli occupiers and their frequent attempts to frustrate any regional or international efforts to end the embargo imposed on the Gaza Strip and to halt hostilities." "Such criminal acts, those that came before, and those still to come will not break the Palestinian people's will and insistence on their inalienable rights, including freedom and independence," Haniyeh said in a statement. Mustafa Barghouthi, the former Palestinian Minister of Information and the Secretary General of the Palestinian National Initiative, called the killings "a sickening tragedy." 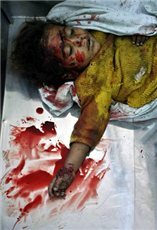 "The killing of innocent women and children in their homes is one of the most shocking consequences of the siege and attacks on the Gaza Strip, which the Israeli government is carrying out under the pretext of security," said Barghouthi. "But tell me who is safer now that Khadra Abu Moatiq and her four young children are dead?" Haniyeh's Hamas movement rules the Gaza Strip, while Abbas' Fatah faction holds power in the West Bank. Abbas dismissed Haniyeh and a Hamas-Fatah unity government last June after Hamas took control of Gaza. 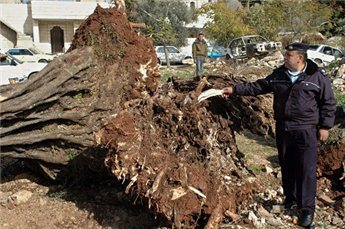 (IRIN) - It was difficult for 87-year-old Jamil Khader to discover that nearly all of the 1,400 olive trees his extended family planted in February had suddenly gone missing, having been uprooted and stolen. The last job gave him enough money to purchase the plot of land near Nablus, which has become the family's most important possession. They, like others, have become increasingly dependent on agriculture for their livelihood as harsh restrictions on movement have cut them off from their former jobs as labourers inside Israel. "I am completely reliant on agriculture; I don't have any other work," said Khalil, who is also registered with UNRWA, the UN agency for Palestinian refugees. This was, in fact, the fourth time in a decade that the village's agriculture had been attacked. In the 1990s arsonists burnt down many hectares of olive trees. In 2005 another wave of violence destroyed most of the remaining trees. ***This item comes to you from IRIN, the humanitarian news and analysis service of the UN Office for the Coordination of Humanitarian Affairs. The opinions expressed here do not necessarily reflect those of Ma'an. A delegation representing the Popular Resistance Committees (PRC) will head to Cairo on Monday at Egypt's invitation in order to discuss a possible ceasefire with Israel, a prisoner exchange, and Israel's siege of the Gaza Strip. According to PRC spokesperson Abu Mujahid, PRC Secretary-General Hajj Kamal Nayrab, known as "Abu Awad," and Mohammed Al-Baba, the director of the PRC's information office will attend the Egyptian-sponsored meetings. Abu Mujahid said that "the PRC believes Israel has always broken previous ceasefire agreements." He said a ceasefire should be bilateral and comprehensive, meaning that it must halt all Israeli hostilities and lift the siege imposed on the Gaza Strip. There must be guarantees that Israel will stick to any agreement that may be signed. The PRC began as an armed movement to defend refugee camps in Gaza from Israeli incursions at the beginning of the second Palestinian Intifada, or uprising. 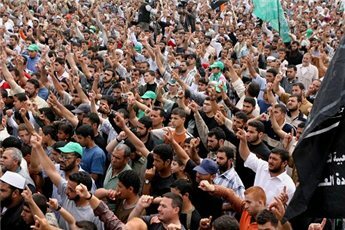 The group is composed of fighters and security officials from numerous other Palestinian factions. Leaders from the left-wing Popular Front for the Liberation of Palestine (PFLP) and the Democratic Front for the Liberation of Palestine (DFLP) are also attending meetings with Egyptian officials in Cairo on Monday. Egypt is leading efforts to mediate between Palestinian factions in the Gaza Strip and Israel. Israeli forces invaded the northern West Bank town of Al-Yamun, west of the city of Jenin, and ransacked several Palestinian homes after midnight on Sunday. No arrests have been reported. Palestinian security sources said that 13 Israeli military vehicles raided the town at 1:30am searching for "wanted" Palestinian activists. Eyewitnesses said that the Israeli troops fired live ammunition in the air and detonated sonic bombs. Israeli military vehicles patrolled the town till the early morning hours. More than twenty Israeli military vehicles invaded the northern West Bank town of Kafr Qaddum, east of Qalqilia, overnight, witnesses said. The invading forces surrounded home of Wisam Shtaiwi and Ahmad Jum'a, forcing the residents of the houses into the street before searching the houses. The military wing of Islamic Jihad, the Al-Quds Brigades, claimed responsibility on Sunday for hurling an explosive device at an undercover Israeli force which they discovered east of Al-Maghazi refugee camp in the central Gaza Strip. The military group said in a statement that the bomb hit its target and that the operation came in retaliation for "ongoing Israeli atrocities against the Palestinian people." Israeli forces on seized five Palestinians in the southern West Bank district of Bethlehem. Israeli sources said that the Israeli army raided the town of Al-Khadr, south of Bethlehem, and apprehended five allegedly wanted activists. Exiled Hamas political leader Khalid Mash'al says that Hamas is open to a tactical truce with Israel, but is prepared to escalate violent attacks if Irael rejects an offer for a ceasefire. Mash'al made these comments during an interview with Al-Jazeera television after a day of meetings with Egyptian intelligence chief Omar Suleiman, who has been mediating between Hamas and Israel. Mash'al said that his movement is still waiting on Egypt's official stance on the issue of a six-month ceasefire. He said: "It is normal for any resistance that operates in its people's interest ... to sometimes escalate, other times retreat a bit... The battle is to be run this way and Hamas is known for that." "We are ready to cooperate seriously from a place of power," he added, warning, "If Israel does not accept, then we welcome confrontation." Mash'al demanded that Israel lift its blockade of the Gaza Strip, saying, "If the blockade is not to be lifted from Gaza, then the Gaza Strip will explode." The Hamas leader also said he is ready to hold reconciliation talks with Palestinian President Mahmoud Abbas, also the leader of the rival Fatah movement. Several Israeli military vehicles moved a short distance into the Gaza Strip in the Quz Abu Hamam area, east of the town of Deir Al-Balah, in the Gaza Strip on Sunday morning, witnesses reported. Israeli bulldozers proceeded to dig up Palestinian agricultural lands. Meanwhile, Hamas' armed wing, the Al-Qassam Brigades, announced that their fighters launched a rocket-propelled grenade (RPG) and four mortars towards the invading Israeli forces. Israel's military attacks are thwarting Egyptian efforts at brokering a ceasefire between Israel and Palestinian military factions, an Islamic Jihad leader asserted on Saturday. "The Israeli incursions and invasions aimed at foiling the Egyptian efforts to reach the calm in the region to result in the opening of the crossing and breaking the blockade," Islamic Jihad leader Khaled Al-Batsh told Ma'an. "The occupation forces are continuing their aggression against our people in the Gaza Strip and the West Bank aimed to exert pressure on the Palestinian people and its resistance factions," he added. The most recent Israeli incursion on Saturday morning in the Gaza Strip left a 14-year-old girl dead and seven others wounded after Israeli forces caused a shootout while attempting to arrest a Hamas leader. 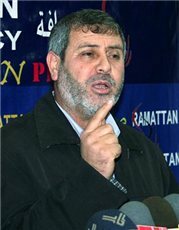 "The resistance operations initiated by the Al-Quds Brigades [Islamic Jihad's armed wing] to break the siege and the last operation which was killing an Israeli colonel and his bodyguard is an evidence of the strength and solidity of the Palestinian people and a clear message that they will not surrender to the occupation pressure and practices," Al-Batsh said. 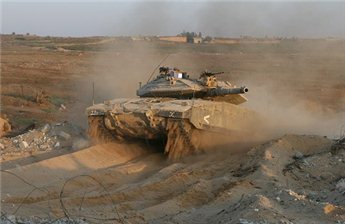 Five Israeli tanks and two armored bulldozers entered the Gaza Strip near the Kerem Shalom (Karem Abu Salem) crossing point just after noon on Saturday, witnesses said. Witnesses added that the bulldozers are clearing the area where Hamas fighters attacked the crossing point with car bombs last week. Thirteen Israeli soldiers were wounded in that attack. Israeli settlers shot a Palestinian police officer near the West Bank village of Yasuf, south of Nablus, before fleeing on Thursday, witnesses said. Twenty-four-year-old Issam Abdel Kader Isa said that six Israelis, apparently from the nearby Kfar Tappuah settlement, opened fire at him while he was standing near his house on Thursday. Isa was treated at Yasser Arafat Hospital in the town of Salfit for wounds on his hands. Medics called his injuries "moderate." Isaa works at a training center for Palestinian police officers near the West Bank city of Jericho. Israeli forces killed a 14-year-old girl, Maryam Tal'at Ma'rouf, and injured her mother, Samyah Ma'rouf, along with six others during an incursion in Beit Layiha, in the northern Gaza Strip on Saturday, witnesses said. Israeli special forces, with helicopters hovering overhead, invaded Beit Layiha at dawn, surrounding the house of Hamas leader Samyah Ma'rouf. 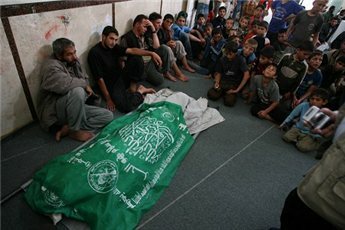 Witnesses said the Israeli troops opened fire on the house, killing the child. Israeli troops engaged in a heavy exchange of fire with Palestinian fighters in the area. The Israeli forces withdrew at 7:30am after seizing Tal'at Ma'rouf. Muawiyah Hassanein, the director of emergency and ambulance services in the Palestinian Health Ministry, identified some of the wounded: 40-year-old Saleh Ma'rouf, Saleh Ma'rouf, 27-year-old Zuhair Sobh, Ziad, 28-year-old Mustafa Sobh, 25-year-old Ahmad Abd al-Muttalib Al-Kahlout, 14-Year-old Al-Kahlout. All of the injured were treated at Kamal Udwan Hospital in northern Gaza. Palestinian resistance fighters claimed to have forced the Israeli troops to retreat. The National Resistance Brigades, the armed wing of the left-wing Democratic Front for the Liberation of Palestine (DFLP), said it engaged in armed confrontations with Israeli forces near the Al-Baraka Mosque in northern Gaza, claiming that there may be casualties on the Israeli side. The Abu Ali Mustafa Brigades, the armed wing of the Popular Front for the Liberation of Palestine (PFLP), and the Al-Aqsa Brigades, the armed wing of Fatah, claimed responsibility for attacking Israeli special forces in the Ash-Shayma' area north of Beit Lahiya at dawn. The Al-Quds Brigades, the armed wing of Islamic Jihad, also said they clashed with the Israeli forces that infiltrated in the northern part of the Gaza Strip. The An-Nasser Salah Ad-Din Brigades also claimed to have clashed with the Israeli unit that infiltrated to the area. For its part, the Al-Qassam Brigades, the military wing of Hamas, clashed with the Israeli forces at dawn on Saturday in Al-Da'our area.